Home > Eco Touch All Purpose Cleaner 128 oz. Eco Touch All Purpose Cleaner 128 oz. Hard on grease, easy on you and the environment. 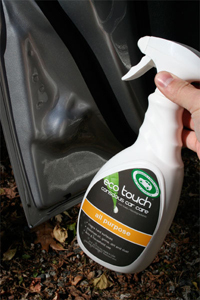 Eco Touch All Purpose Cleaner is a safe and effective cleaner and degreaser for your vehicle's dirtiest surfaces. Made out of natural ingredients, Eco Touch All Purpose Cleaner removes grease, dust, and dirt with ease. Use it on vinyl, metal, wheels, plastics, and more. Eco Touch All Purpose Cleaner is unique among APCs. It contains water, surfactants, a soy-based solvent, and lemon orange essential oils to clean and degrease safely. You won't find any caustic chemicals or harsh fumes here. Eco Touch All Purpose Cleaner is made to be tough on grease and grime but gentle on you and the environment. It has a pleasant citrus smell. Eco Touch All Purpose Cleaner can be used full-strength on all hard surfaces plus vinyl. It dissolves oils, grime, dirt, and dust. You'll find countless uses for Eco Touch APC around your vehicle, garage, and home. Use Eco Touch All Purpose Cleaner wherever you'd use an APC. Its blend of powerful surfactants and natural cleaning agents makes it just as effective as any APC you've used before.